Did you know that the sense of smell is the one sense most closely associated with mood and memory? Imagine your favorite memory- is there a scent associated with it? Scents can be comforting, invigorating, and grounding. Through the use of essential oils in aromatherapy, you can trigger the mood you desire quickly and efficiently… all right under your nose. How Do Essential Oils and Aromatherapy Work? An essential oil is a liquid that is usually distilled, using steam or pressure, from the leaves, stems, flowers, barks, or roots of a plant having therapeutic properties. Pure essential oils are about seven times more concentrated than the whole plant. Aromatherapy is the use of essential oils through various methods, including inhalation, facial steams, and heat or ultrasonic diffusion. Each method stimulates smell receptors in the nose, which then send messages through the nervous system to the limbic system- the part of the brain that controls emotions. Essential oils are also highly effective when absorbed through direct contact with the skin. This is because 100% pure essential oils have a relatively small, lipid-soluble molecular structure that is absorbed through the skin directly into the bloodstream. Once in the bloodstream, they reach deeply into the circulatory system to cleanse, restore and encourage cellular health, tissue and muscular tone. These benefits are best achieved through massage with an essential oil diluted in a carrier oil or through bathing with the essential oils added to the water. Please keep in mind that with the exception of Lavender, Patchouli, Ravensara, Sandalwood, and Tea Tree oils, essential oils must be added to a carrier oil or other product. 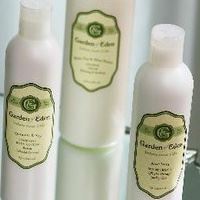 This is the Garden Gal’s secret... at Garden of Eden, we can custom-scent any of our private label products, including bath and shower gel, massage oils, lotions, and other hair and body products. Visit the store and we will gladly help you create a product just right for you! Are you interested in learning more about aromatherapy? Stop by the store this weekend (April 20-21 2013) during the Grand Avenue Wellness Weekend. We will have samples of Eucalyptus, Lemon, and Tea Tree essential oils and share more information on incorporating essential oils into a wellness program. Can’t make it this weekend? Stop in anytime and discover which essential oils are best for you. Essential oils are highly concentrated; use them by the drop. Never use undiluted essential oils with the exception of Lavender, Patchouli, Ravensara, Sandalwood and Tea Tree, always use a carrier oil or base. When trying something new, do a patch test on your forearm before using on your skin by mixing one drop essential oil in a teaspoon of vegetable oil and apply to inside of your arm. Citrus oils including Bergamot, Grapefruit, Lemon, Orange, and Tangerine are photosensitizers and should not be used prior to sun exposure. * If you are or may be pregnant, avoid these oils: Bitter Almond, Basil, Birch, Camphor, Cedarwood, Cinnamon, Clary Sage, Clove, Fennel, Hyssop, Juniper, Marjoram, Myrrh, Oregano, Pennyroyal, Peppermint, Rosemary, Rose, Sage, Savory, Thyme and Wintergreen. No more than a 2% concentration of any other oils in a base, is recommended during pregnancy.